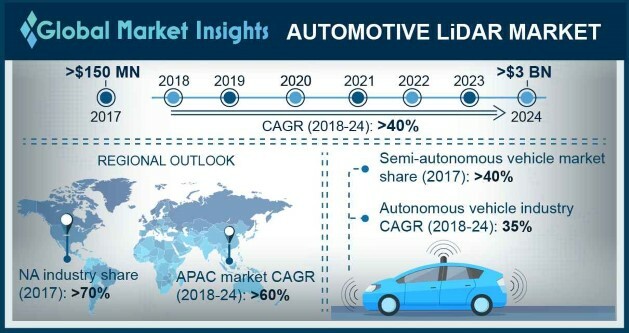 Automotive LiDAR Market size is set to exceed 3 million units with a market value of more than USD 3 billion by 2024; according to a new research report by Global Market Insights, Inc. The automotive LiDAR market is propelled by increasing investments in the development of the autonomous vehicles. The automakers are concentrating on R&D activities for the development of the self-driving technology. BMW has recently announced its plans to invest USD 8.6 billion in 2018 to intensify the R&D efforts for the self-driving technology. Similarly, other automakers such as Ford, General Motors, Toyota, and Honda have also invested approximately USD 1 million to test new autonomous vehicles on public streets and freeways. The technology giants such as Google and Intel are also working for the development of autonomous solutions. Growing concerns toward safety among regulatory bodies and customers to safeguard vehicles and passengers also promote the automotive LiDAR market. The government across the countries are constantly working on enhancing the safety of the vehicles by mandating the use of advanced driving assistance systems in the vehicles and modifying the vehicle safety systems. For instance, the European government’s New Car Assessment Program (NCAP) is promoting the use of ADAS systems into the vehicle to ensure safety. Similarly, the U.S. has established the National Highway Traffic Safety Administration (NHTSA), which has introduced new guidance systems for the Automated Driving Systems (ADS). The autonomous vehicle market is anticipated to grow at a CAGR of more than 65% over the forecast timespan. The growing demand for the LiDAR sensors among the automotive manufacturers for self-driving cars is the primary factor driving the market. The LiDAR sensors are being widely used in autonomous vehicles to create a 3D model of its surrounding environment using light pulses. It assists vehicles in measuring the accurate distance from any objects within its vicinity. Its superior property and high accuracy as compared to other alternative products such as radar, imaging sensors, and ultrasonic are augmenting its demand. The solid-state LiDAR market is projected to grow significantly over the projected time period. This technology is in the development phase and is expected to be commercialized by 2020. However, the technology is gaining a lot of traction from the automakers due to its cost-effective nature and compact size. Its entire assembly is built on a silicon chip. Hence, there are no moving components present, making the system more resilient to vibrations. This allows the manufacturers to produce smaller parts at a lower price. The North America is dominating the automotive LiDAR market with a market share of over 70% in 2017. This growth can be attributed to favorable government policies. For instance, in 2016, the Canadian government introduced Ontario Regulation 306/15 that permitted the testing of self-driving vehicles. In addition, the automotive companies in the region have invested heavily in the development of the automotive LiDAR technology. The Asia Pacific automotive LiDAR market is anticipated to grow at a CAGR of over 60% during the projected timeline. The presence of the major automotive LiDAR technology providers such as Robosense and Benewake in the region has fostered the growth of the market. These companies are investing heavily in the R&D activities to accelerate innovations in the automotive LiDAR technology. For instance, in 2018, RoboSense has partnered with Alibaba to develop solid-state LiDAR technology for autonomous vehicles. The prominent players operating in the automotive LiDAR industry are Leddertech, Continental, Luminar Technologies, Aptiv, Magna, Blackmore Sensors & Analytics, Oryx Vision, Audi, Mercedes-Benz, Tesla, BMW, Nissan, Trilumia, Uber, ZF, Innoviz Technologies, Velodyne, Quanergy, and Volvo. The major companies in the automotive LiDAR market are forming alliances with other expert companies in the market to develop new product offerings and conduct strategic acquisitions, to gain a competitive advantage over its competitors. For instance, in 2018, Innoviz Technologies, an Israeli LiDAR startup partnered with Magna, a Canadian automotive supplier to provide BMW with solid-state LiDAR components for its self-driving vehicles. Similarly, in 2017, General Motors (GM) acquired Strobe, a startup specializing in automotive LiDAR technology for autonomous vehicles. This acquisition was aimed at incorporating Strobe’s LiDAR technology into Cruise Control, a subsidiary of GM, which develops the self-driving technology.